When I first got all the info to write my article on it I was so confused! Just amazing architecture, different design ideas which are so distinctive and different from one another, yet they all tie up really well! I felt like a kid left alone without any restrictions in FAO Schwarz toy store and candy shop simultaneously! I just didn’t know where to look at, what to comment on, and I was definitely sure that I would miss out on something! The reason for missing out…I must KISSS (keep it short simple and sweet)! I guess I could write endless pages, talk about it continuously, and probably get some people tired!! 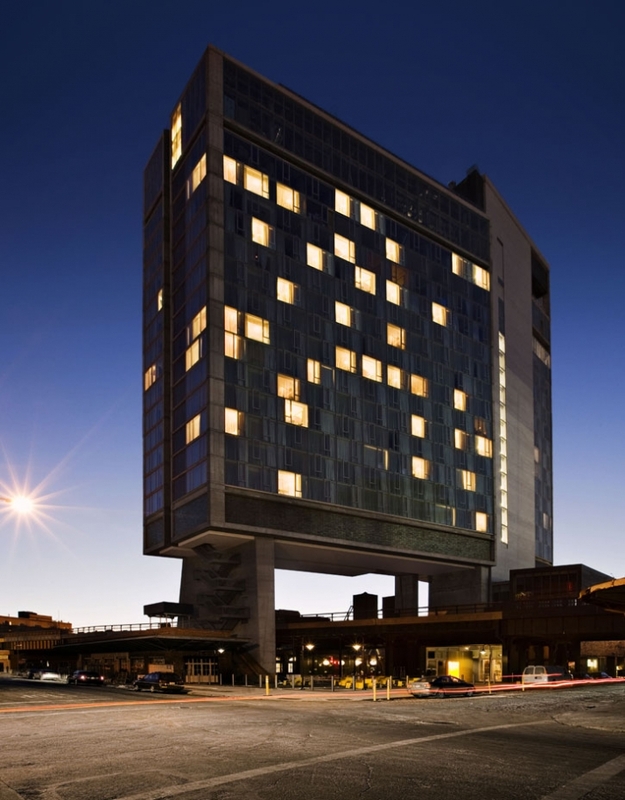 The new Standard Hotel in New York’s meatpacking district is the first of a sequence of projects linked to the development of the High Line, a park built on a segment of abandoned elevated rail tracks which officially opened on June 8th 2009. The towering structure was designed by Todd Schliemann of New York firm Polshek Partnership Architects. While the soul of this development is pioneer in boutique hotel business André Balazs; his company owns another Manhattan hotel The Mercer, the Sunset Beach in Long Island New York, Chateau Marmont in Los Angeles, and the Raleigh in Miami Beach. According to Balazs, he had a hard time visualizing the end result of this project as it was his first ground up construction, in previous hotels Balazs renovated older buildings. Apart from the ground up construction the High Line area was an ultimate challenge; a rapid developing area where the meatpacking district until recently was filled with meat workers and transgender prostitutes _ has become a high-rent district of shops, clubs and restaurants. The “Le Corbusier style” building is supported on huge concrete pillars and extends into two glass-curtain slabs; the construction seems as if it leaps above the old freight tracks of the High Line and floats. Once in view, it reminds us of the classical New York City International Style glass buildings such as the United Nations building. 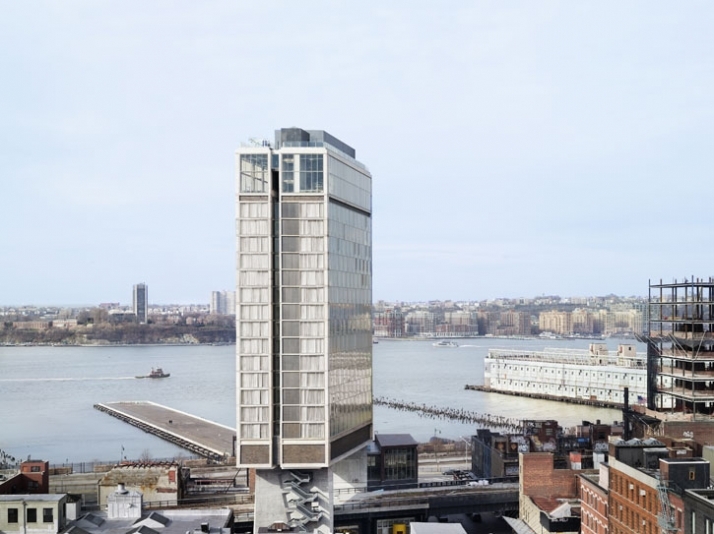 However, this glass heavy form stands up and out of the site and the area’s older industrial structures, while it elegantly (in its unique New York style) coexists with the surrounding environment. Architecturally, the building is designed in such a way that it has a slight bend near the center reminding us of an open book. 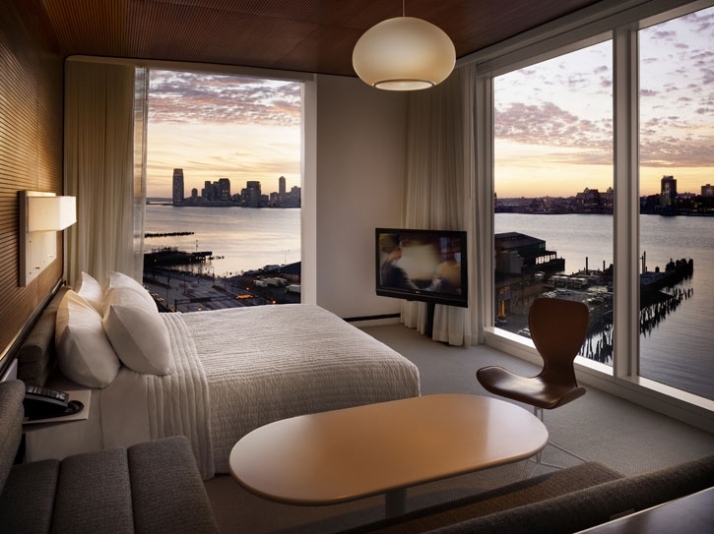 This slight bend gives a sleek appearance in the skyline and orients the rooms toward the most spectacular views of the Hudson River, the Statue of Liberty, and either Midtown or Lower Manhattan. 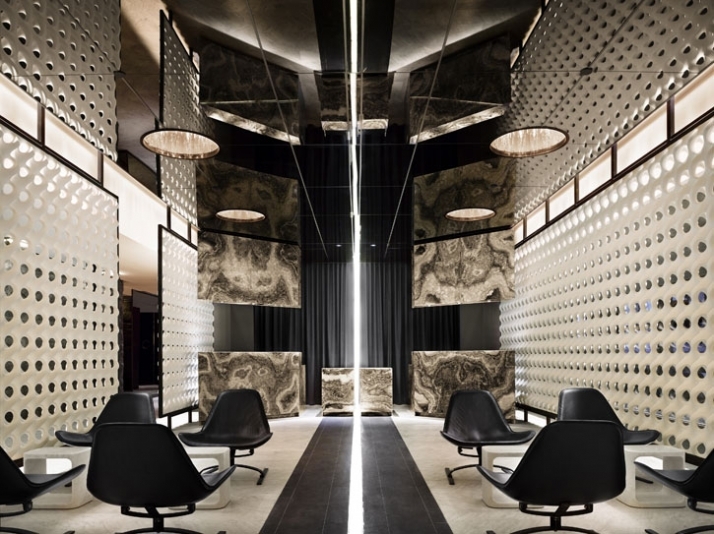 The Standard Hotel building is one that was thoughtfully conceived and offers the most to the occupants and the passers-by. 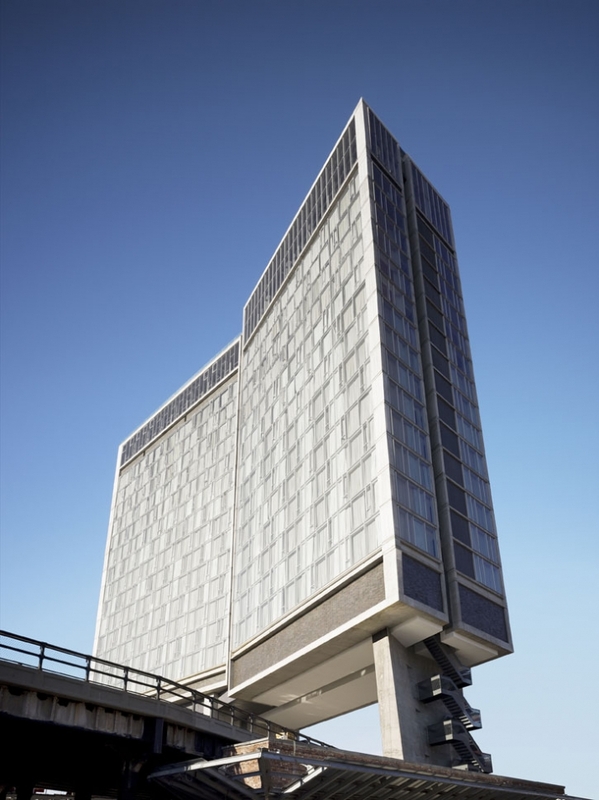 The 18-story structure of Standard Hotel is supported on concrete pilotis, which hold it 17.1 meters off the ground and 9.1 meters above the High Line tracks. The building is raised up because the area beneath and around the Standard will be known as the Gansevoort Woodland. Passers-by will be able to enjoy a walkway with an abundance of birch and redbud trees. While the building floats over a wood planted area on an old railway bridge accessible to the public. In the area beneath the concrete pilotis will lay a ground floor restaurant and a garden café which seem thoughtfully inserted beneath the High Line’s robust steel structure. for the elevators Standard Hotel in NYC. The design concept of the project is that the higher you get the more modern the interior of the Standard gets. The ground floor has a feeling of early last century, at the time of the High Line. The hotel floors are midcentury with reference to a 1950’s hotel in Stockholm designed by Mies van der Rohe, Eero Saarinen and Arne Jacobsen. The top floor has a double-height glass-enclosed space; the supper club and the lounge are decked out in honor to Warren Platner, a protégé of Saarinen’s. Platner, an interior designer of the 1960s and 70s designed the original Windows on the World restaurant, in the north tower of the World Trade Center. The views from the Standard, though 80 stories lower than those from Windows on the World, are comparably impressive. 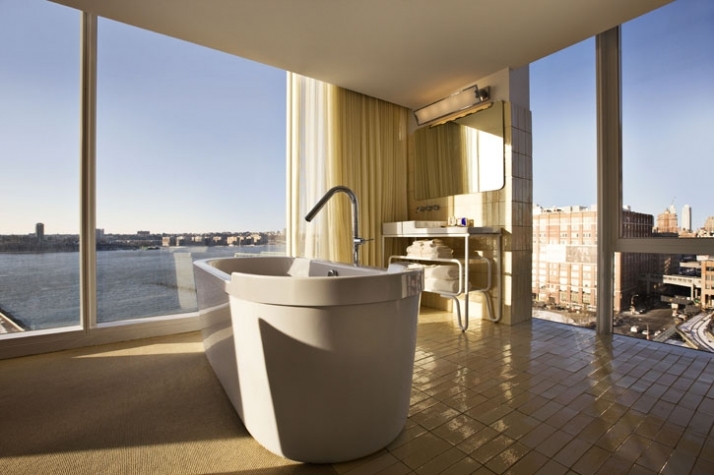 The Standard New York Hotel was designed by Roman and Williams (primarily) and Shawn Hausman. Robin Standefer and Stephen Alesch were also Hollywood set designers before moving to NY to open Roman and Williams. 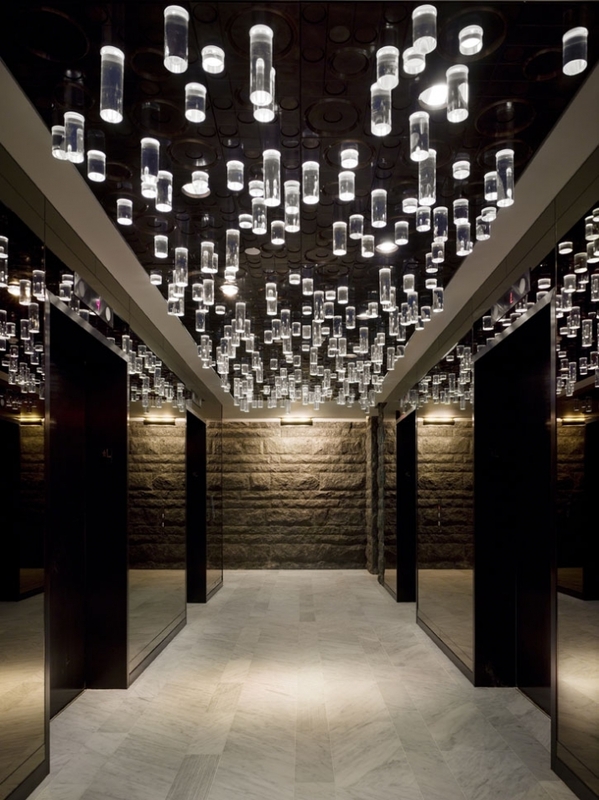 The right balance between innovation and restraint has led Standard Hotel to this amazing result, if I was to keep writing I would write for all the design ideas and how well thought this hotel is. Brilliant and innovative ideas which were taken from the past, brought to the present, and fit accordingly to today’s needs. 337 guest rooms which have a retro late 70’s to early 80’s design, the Standard Grill with the amazing penny tile concept, and among others the magnificent lobby, where the luxury and the simplicity take your breath away. All these features combined with the surrounding environment and the architecture make the smooth industrial design of the Standard! 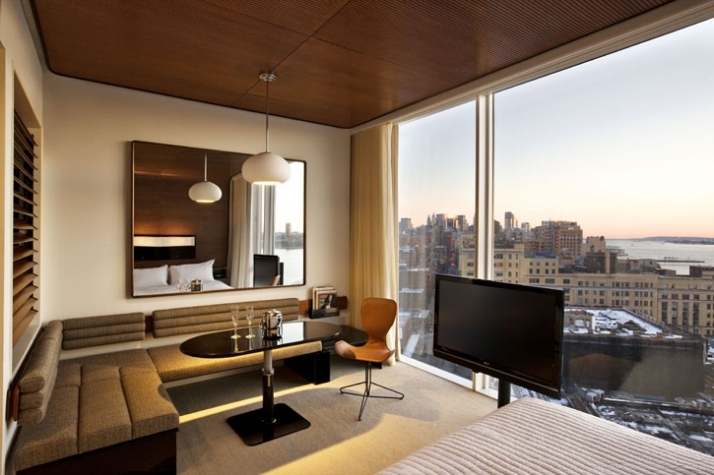 The new Standard Hotel is a NYC must see! 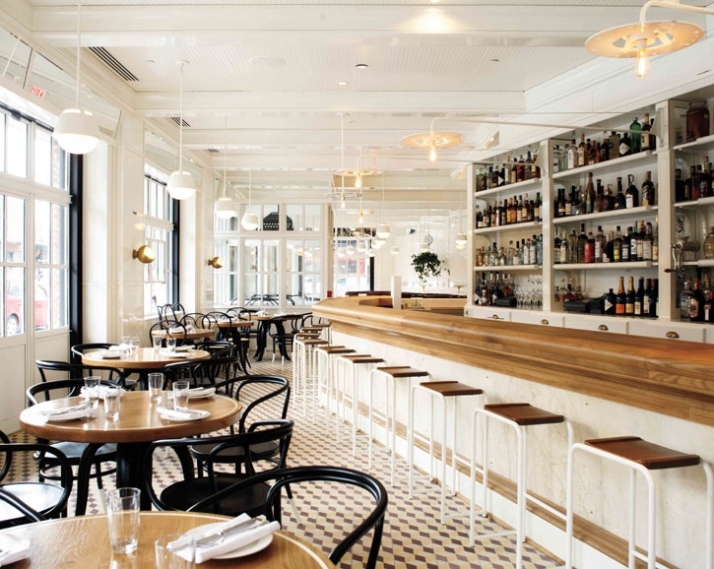 The Standard Grill has received very positive review for both its menu and design. Roman and Williams designed The Standard Grill building and interiors.